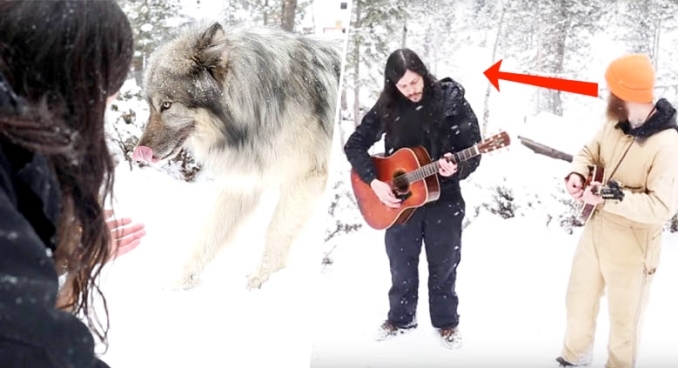 Arkansas folk musician Shawn James knew that visiting a wolf sanctuary would be a special experience, but he had no idea just how much of a hair-raising experience that visit would turn out to be. The temperatures were freezing that day, so they knew they would only get one take. James’ friend, photographer Anna Hutchinson, was with them that day, and she set up her DSLR camera and Zoom recorder outside among the evergreens as the snow fell softly. He doesn’t get much further before the pack of wolves that have been pacing in the background of the shot begin to howl right along with James. It’s a pretty incredible moment, and the musicians can’t help crack a smile as the howling and occasional bark almost overtakes their performance. They do manage to finish the tune, and then open their mouths themselves, and howl like the wild animals that pace in the snow behind them. Responses to "Folk Singer Records Song In Wolf Sanctuary, Wolves Howl Along"
At my home this happened playing Nawang Ketchong Tibetan flute music . Majestic, fascinating wolves making the "vocals" from a distance behind, I love it, what can I say I LOVE IT!